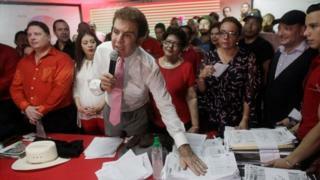 The main opposition candidate in the Honduran presidential election has said he will not accept the poll count despite earlier vowing to respect it. Salvador Nasralla says the electoral court is manipulating results. With 88% of the ballots counted, President Juan Orlando Hernández, who is seeking re-election, is leading the official count by a narrow margin. Earlier, thousands of protesters marched in the capital, Tegucigalpa, accusing the authorities of fraud. Mr Nasralla and his supporters are deeply suspicious of the electoral tribunal, which counts the ballots. Their distrust is partly due to the fact that the tribunal is appointed by Congress, which is controlled by Mr Hernández's National Party, and partly to the sudden reversal of Mr Nasralla's initial lead. There has also been sharp criticism of the slow pace of the count, which came to a 36-hour halt after the first partial results were released on Monday. Mr Nasralla called on his supporters to take to the streets in protest. Tension was lowered temporarily on Wednesday when both Mr Nasralla and Mr Hernández signed a document vowing to respect the final result after every disputed vote had been scrutinised. But another pause in counting attributed by the electoral tribunal to a computer glitch led to Mr Nasralla saying the document "had no validity". "They take us for idiots and want to steal our victory," he said and again rallied his supporters to protest. Police fired tear gas to disperse Mr Nasralla's supporters from outside the electoral tribunal. The head of the tribunal, David Matamoros, has called on Hondurans to be patient. He said that international observers were present at the count and assured voters on Twitter [in Spanish] that "it is impossible to modify the result". The US state department has urged a quick conclusion to the vote count. Good news for Honduras' murder capital?